Jonas Moore at his apartment in Middleton, Wisconsin. medications, therapy and a job in which he works mostly alone. “I don’t look like I have a disability, do I?” Jonas Moore asks me. I shake my head. No, I say — he does not. Bundled up in a puffy green coat, Moore, 35 and sandy-haired, doesn’t stand out in the crowd seeking refuge from the winter cold in a drafty Starbucks. His handshake is firm and his blue eyes meet mine as we talk. He comes across as intelligent and thoughtful, if perhaps a bit reserved. His disability — a form of autism — is invisible. That’s part of the problem, Moore says. Like most people with an autism spectrum disorder, he finds relationships challenging. In the past, he has been quick to anger and has had what he calls meltdowns. Those who don’t know he has autism can easily misinterpret his actions. His difficulty managing emotions has gotten him into some trouble, and he has had a hard time holding onto jobs — an outcome he might have avoided, he says, if his co-workers and bosses had better understood his intentions. Over time, things have gotten better. Moore has held the same job for five years, vacuuming commercial buildings on a night cleaning crew. He attributes his success to getting the right amount of medication and therapy, to time’s maturing him and to the fact that he works mostly alone. Moore is fortunate. His parents help support him financially. He has access to good mental health care where he lives in Wisconsin. And he has found a job that suits him. Many adults with autism are not so lucky. Research on how best to help adults with autism is paper-thin. Of the more than $400 million that the United States spends each year on autism research, the vast majority is for genetics research to find the causes and a cure, and studies on early diagnosis and intervention in children. Few studies have examined treatments for adults. In the past few years, public and private agencies have begun funding efforts to develop therapies for adults with autism. The term “autism spectrum disorder” covers a suite of neurological conditions that range widely in severity and include impairments in communication and social interaction; difficulty regulating emotions; and repetitive or obsessive behaviors and interests. About half of children diagnosed with an autism spectrum disorder are “high-functioning” like Moore, meaning they have average or above-average intelligence. There are no reliable estimates of the number of adults with autism. But the prevalence of children diagnosed with autism has spiked in the past two decades. In 2000, the Centers for Disease Control and Prevention estimated that 1 in 150 children had an autism spectrum disorder. The agency’s 2014 estimate is 1 in 68. The reasons for the increase aren’t fully understood, but researchers believe it is partly due to improved detection. One might expect that people with autism who are most high-functioning would fare best in the adult world. But paradoxically, those without an intellectual disability are most likely to falter when they reach adulthood, partly because they often lose support services after age 21 and partly because social difficulties may frustrate college and career ambitions. Spend time talking with autism researchers or with families of adolescents or adults with autism, and it doesn’t take long for the phrase “falling off a cliff” to come up. The new environments, new people and expectations for independence that come with entering adulthood can be tricky for any young person. For someone with impaired abilities to communicate and manage relationships, to solve problems flexibly and to regulate emotions, this period can be harrowing. And the end of adolescence means the end of federally-mandated special education services — just when the need for support may be greatest. In a study of 242 teens, Taylor and a co-author found that young people’s autism symptoms and behaviors often improved during adolescence. But progress typically slowed markedly, or even stopped, after students left high school. Paul Shattuck directs the Life Course Outcomes program at Drexel University’s Autism Institute in Philadelphia. He has spent much of the past five years dissecting data from a nationally representative survey of adults who received special education services during high school, including students with autism. Shattuck’s results are bleak. Within just a few years of leaving high school, almost 40 percent of the young adults in his sample were receiving no medical, mental health, case management, or speech or language services, he and colleagues reported in JAMA Pediatrics in 2011. In another study a year later, Shattuck’s team found that more than half of young adults with autism were “completely disengaged” from any employment or post-secondary education in the two years after leaving high school. Poor employment outcomes are especially dismaying because good employment may make a world of difference for autistic adults’ personal development. A 2014 study found that the more independence autistic adults had at work, the more improvement they showed over the next five years in social interactions, communication skills, repetitive behaviors, self-harm, socially offensive behavior and activities such as housekeeping and making meals. Making small talk. Small talk — “Can you believe this weather?” “How about that basketball game last night?” — is an essential social skill. But it is one that many people with autism aren’t wired for. At work, someone who has difficulty responding smoothly to seemingly inconsequential questions such as “How was your weekend?” might be perceived as aloof or unintelligent. Interpreting body language and facial expressions. A person with autism may miss or fail to understand subtle but important nonverbal cues. For example, gestures or furrowed brows might signal that two co-workers are in the midst of a conflict and that it would be best to steer clear. Following unspoken social rules. If social expectations are not made explicit, a person with autism may not realize he or she is committing a faux pas by doing something that is outside the norm in a work setting, such as discussing personal matters or talking too loudly. Remembering and following instructions. It can be difficult for people on the autism spectrum to follow multi-step verbal instructions, especially if those that are given quickly. Adapting to changes. A shift in routine or an unexpected event that might appear small to someone without autism, such as an adjustment to work hours or a change in supervisor, can be difficult for someone with autism. Planning and organizing. No one’s memory is infallible — that’s why many people keep checklists and calendars and why they designate specific places for their keys or cellphone. Most people adopt such organizational tricks without much thought. But for many people with autism, doing so does not come naturally. “Prospective memory strategies,” as they are called, must be explicitly taught. The misconception about people with autism, UCLA clinical psychologist Elizabeth Laugeson says, is that they are asocial and perfectly happy being alone. Laugeson runs a program that provides participants with concrete rules of social behavior. It includes having them practice such social skills as entering and leaving conversations, handling teasing and organizing get-togethers. Adults going through her program demonstrate better overall social skills, improved social responsiveness and more social engagement, she says. Perhaps best of all, they feel less lonely and isolated. A 2012 review of studies done between 1950 and 2011 found only a handful, including Laugeson’s, that had assessed psychologically-based interventions for adults with autism. Like Laugeson’s program, most of the interventions had positive results. But the small number of studies and wide variability in their methods and in the size of their effects make it difficult to draw conclusions about the effectiveness of any given intervention, says doctoral student Lauren Bishop-Fitzpatrick, the review’s lead author. In the past several years, the federal government and private organizations have upped their investment in adult intervention research. In September, the National Institute of Mental Health awarded three grants totaling nearly $760,000 to support development and testing of new intervention programs for adults with autism. Autism Speaks has spent $2.73 million on adult-focused research since 2010. Only about $650,000 of this has been for treatment studies, says Rob Ring, the research and advocacy organization’s chief scientific officer. But he says investment in such research is bound to rise. “As we become more acutely aware of the tidal wave of individuals who are transitioning into adulthood, we’re becoming very much aware of the needs that are out there for adults,” he says. 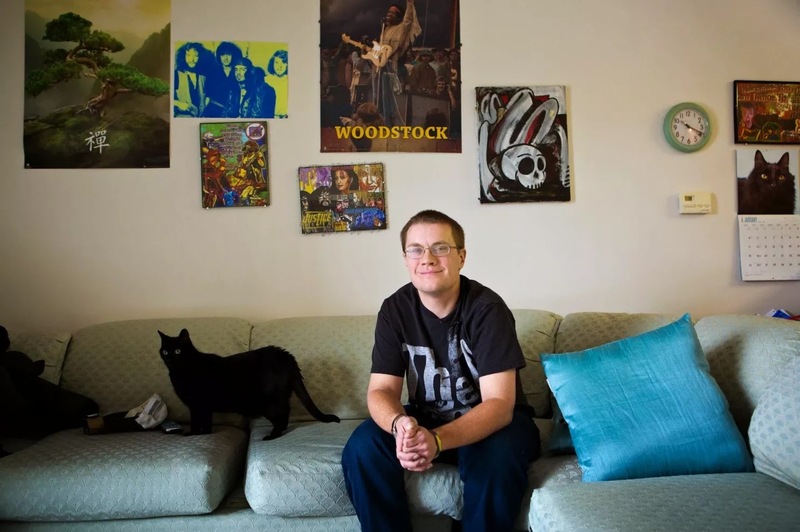 Few adults with autism make their way in the world on their own. For most, family members are an important, often daily, source of support. Among other things, participants will rehearse problem-solving steps and learn a coping strategy that can help reduce stress: reinterpreting challenges or difficult events as opportunities for growth. “Even if you can’t change the stressor, you can change how you think about it,” Smith says. Smith’s emphasis on family counters what Shattuck says is the dominant approach to studying autism. Most autism research, he says, “presumes there’s something defective with the person, and if we want the person to have a better outcome, we need to fix the person.” Shattuck believes researchers should also seek ways to improve the wider social context for adults with autism, from strengthening housing and vocational support services to educating police departments about aspects of autism that might influence police encounters. This piece was excerpted from a longer article produced by Science News.